The Act also incorporates student participation in college coursework on local school and state report cards as a component of local school district plans to transition students to postsecondary education, and as a potential indicator in state accountability systems. Finally, the Act includes, for the first time in federal statute, a definition of dual and concurrent enrollment programs and early college high schools to establish consistent terminology for this work. With this new federal flexibility, NACEP will work with states and local education agencies to identify opportunities to leverage federal programs to further state and local dual and concurrent enrollment priorities. In 2016, NACEP joined with four partner organizations to launch the College in High School Alliance – a coalition of 50 leading national and state organizations committed to raising awareness and support for dual and concurrent enrollment and early college opportunities. One of the first priorities of the Alliance has been to work with states to incorporate dual and concurrent enrollment into their state plans for implementing ESSA. CHSA – Recommendations for the Trump Administration: Recommendations for Improving College Success By Building Effective Transitions Between High School and College. The Strengthening Career and Technical Education for the 21st Century Act, a reauthorization of the Carl D. Perkins Career and Technical Education Act (referred to as Perkins V) encourages states and local entities to consider dual and concurrent enrollment as critical pathways for postsecondary attainment in high-value career fields. Schools around the country have demonstrated that dual and concurrent enrollment programs can close the skills gap by propelling students to successfully earn highly-valuable portable college credentials and degrees. Numerous Congressional offices drafting the Act successfully advocated for provisions supporting dual and concurrent enrollment courses as allowable uses of Perkins funds at the local, state, and national levels, as elements of state and local plans, and as an optional indicator in state accountability systems. In addition, the reauthorization expands the federal Perkins support of dual and concurrent enrollment beyond the few areas that the 2006 law had already identified dual and concurrent enrollment as effective college transition tools for CTE students. NACEP works with state legislators, agencies, and college and university systems to develop quality concurrent enrollment partnerships and hold them accountable to high standards. As the only national set of standards of excellence for concurrent enrollment partnerships, NACEP’s standards serve as a model for statewide quality standards in 20 states. State policy in ten of these states additionally require, provide incentives, or encourage colleges to obtain NACEP accreditation. NACEP’s October 2010 report Promoting Quality: State Strategies for Overseeing Dual Enrollment Programs documents the strategies employed by six states to ensure that college courses offered to high school students are of the same high quality and rigor as courses offered to matriculated college students. All public colleges and universities that offer concurrent enrollment courses must be NACEP accredited or undergo a state authorization review by the Concurrent Review Committee (CRC) and obtain approval from the Coordinating Board. All public postsecondary institutions offering concurrent enrollment courses must earn NACEP accreditation or otherwise seek state approval from the Indiana Commission on Higher Education. Commission policy requires programs that are not accredited by NACEP to demonstrate adherence to NACEP’s standards and undergo state review. The 2008 Senior Year Plus legislation standardized concurrent enrollment programs across the 15 community colleges and established a Postsecondary Course Audit Committee to oversee course quality. The community college Presidents agreed to fulfill the law’s quality assurance goals by pursuing NACEP accreditation for each college. 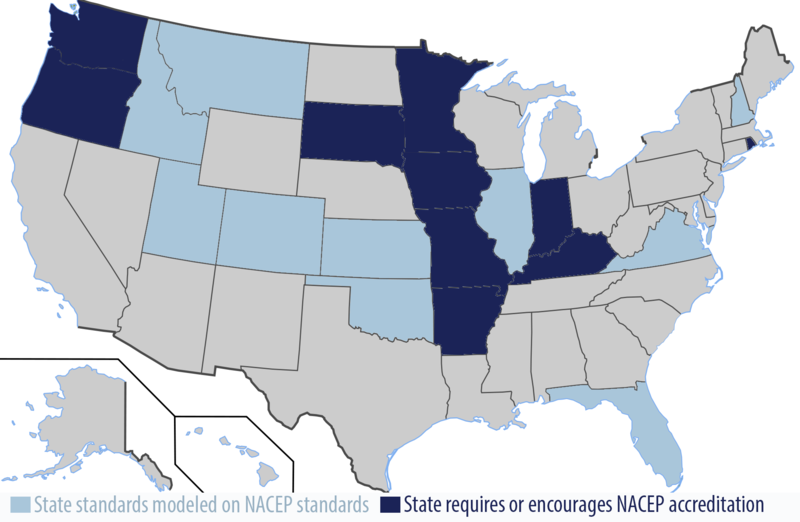 In 2015, Iowa became the first state where all concurrent enrollment providers hold NACEP accreditation. Revisions to the state’s Dual Credit Policy adopted by the Council in June 2015 strongly encourage all participating postsecondary institutions to pursue NACEP accreditation for their concurrent enrollment programs. When the legislature decided to provide funding for concurrent enrollment courses in 2007, it ensured that it was only paying for quality courses by providing funds to districts only for courses from NACEP-accredited programs, or those that demonstrate adherence to comparable standards. Additionally, the Postsecondary Education Opportunities Act requires that Minnesota public colleges and universities award transfer credit for any courses taken through a NACEP-accredited program. 2015 legislative changes require all postsecondary institutions offering concurrent enrollment to adopt and implement NACEP’s standards by the 2020-21 school year. June 2015 updates to the state’s Dual Credit Policy requires all institutions offering concurrent enrollment to demonstrate compliance with the policy by obtaining NACEP accreditation or are subject to review by a committee appointed by the Missouri Department of Higher Education (not yet established). The Oregon Joint Boards of Education established the Dual Credit Oversight Committee to conduct program approvals of dual credit programs offered by all 17 community colleges and 4 of the 7 public universities. The Committee adapted NACEP’s standards as the basis for approvals in 2010, and exempts those programs that have earned NACEP accreditation from the state approval process. 2018 updates to the state’s Dual Enrollment Regulations requires all public postsecondary institutions to adhere to NACEP’s standards and encourages them to obtain NACEP accreditation. In 2010 the Regents, which sets policy for the South Dakota University System, granted blanket acceptance of concurrent enrollment transfer credit for courses taken through NACEP-accredited programs. Credit is otherwise only accepted for concurrent enrollment if a college receives prior approval from the Board of Regents or students earn credit through CLEP or Advanced Placement exams. 2015 legislation establishing state funding for College in the High School (concurrent enrollment) linked the program to nationally recognized standards. An inter-agency workgroup developed rules, adopted in 2016, that required programs to provide annual evidence of adherence to state quality standards based on NACEP’s standards. NACEP accredited programs are exempt from annual review. State policy frameworks governing concurrent enrollment vary considerably among the 50 states, ranging from states with limited policies to those with considerable layers of state oversight prompted by state legislation, regulation, and policies. Some states have policies specific to concurrent enrollment partnerships where high school teachers offer college courses in their classrooms, while other policies address a wide range of dual enrollment opportunities regardless of location or instructor. In many states, public university and/or college systems play a key role in establishing policies and influencing concurrent enrollment practice among individual institutions. High School Reform Database, Education Commission of the States (last updated February 2015). Includes state profiles based on specific policy components, recent policy developments, and links to ECS policy briefs. Dual Enrollment is among the two dozen topics covered. Dual Credit in U.S. Higher Education: A Study of State Policy and Quality Assurance Practices, commissioned by the Higher Learning Commission (February 2013). State Higher Education Policy Database, Western Interstate Commission for Higher Education. An index to states’ laws, regulations, and policy on a variety of education topics, including Dual or Concurrent Enrollment (search under Accelerated Learning Options). Dounay Zinth, Jennifer. Increasing Student Success in Dual Enrollment Programs: 13 Model State-Level Policy Components. Denver, CO: Education Commission of the States (February 2014). Hoffman, Nancy and Joel Vargas. A Policymaker’s Guide to Early College Designs: Expanding a Strategy for Achieving College Readiness for All. Boston, MA: Jobs for the Future (October 2010). Hoffman, Nancy, Joel Vargas, and Janet Santos. On Ramp to College: Policymaker’s Guide to Dual Enrollment. Boston, MA: Jobs for the Future (May 2008). Karp, Melinda Melchur, Thomas R. Bailey, Katherine L. Hughes, and Baranda Fermin. Update to State Dual Enrollment Policies: Addressing Access and Quality. New York, NY: Community College Research Center, Columbia University, Teachers College (2005). Krueger, Carl. Dual Enrollment: Policy Issues Confronting State Policymakers. Denver, CO: Education Commission of the States (March 2006). Lerner, Jennifer Brown and Brand, Betsy. The College Ladder: Linking Secondary and Postsecondary Education for Success for All Students. Washington, D.C.: American Youth Policy Forum (September 2006). Michelau, Demarée K. “The State Policy Landscape” in Accelerated Learning Options: Moving the Needle on Access and Success. Boulder, CO: Western Interstate Commission for Higher Education (June 2006). Ward, Diane and Joel Vargas. What Gets Measured Gets Done: Adding College-course Completion to K-12 Accountability Systems. Boston, MA: Jobs for the Future (October 2011). These matching grants support state efforts to increase the number of low-income students prepared for and succeeding in college. Delaware, Georgia, Idaho, Ohio, Nebraska, New Jersey, New Hampshire, and North Dakota have used CACG funds to provide dual enrollment scholarships for low-income students, as well as grants to colleges and consortia to establish new and expand existing dual enrollment programs. Department guidance for School Improvement Grants identify accelerated coursework, including dual enrollment, as a turnaround strategy for raising the rigor of the curriculum in low-achieving high schools. The Department’s Handbook on Effective Implementation of School Improvement Grants (2011) identifies dual enrollment partnerships with higher education institutions as one of five structural changes that low-achieving high schools might take to create enhance learning opportunities. School turnaround strategies for low-achieving high schools included increasing the rigor of curriculum through accelerated coursework, including dual enrollment. Race to the Top also included priorities for states to increase P–20 coordination, vertical and horizontal alignment as well as university partnerships to support STEM education. Dual enrollment included in cradle-to-career community, school and college partnerships to significantly improve educational levels in distressed communities. While states have taken the lead in enacting concurrent enrollment policy, federal policy has encouraged states to pursue concurrent enrollment as a strategy for college and career readiness and success. NACEP worked with bipartisan congressional supporters to include dual and concurrent enrollment in the Higher Education Opportunity Act of 2008. Federal investment should be sustained these programs, as well as College Access Challenge Grants, which have successfully increased the number of youth pursuing postsecondary degrees that provide them with the skills necessary for success in today’s economy. Federal Perkins Act funds have provided considerable support for colleges and high schools to offer career and technical programs of study including concurrent enrollment as keystone courses in career pathways. The Act mandates that states include dual and concurrent enrollment programs in their 6-year state plans, and allows federal career and technical education funds to support professional development and equipment for dual and concurrent enrollment courses. GEAR-UP supports K-16 partnerships that enroll low-income middle and high school students in rigorous college preparatory course work, while providing them with comprehensive academic supports and college advising. The Act encourages GEAR-UP state and partnership grantees to incorporate dual and concurrent enrollment courses into low-income students’ courses of study. After 9/11, Congress recognized the urgent need to increase the number of students studying critical foreign languages such as Arabic, Chinese and other Mideast and Asian languages. Foreign Language Partnerships offer K-16 programs of study leading to high levels of language proficiency at the postsecondary level, including dual enrollment programs offering college foreign language courses to high school students.